The International Monetary Fund on Tuesday cut its global growth outlook for the third time in six months, citing concerning macroeconomic factors in developed and emerging countries. The IMF sees global economic growth of 3.3% this year, down from the 3.5% its forecast in January amid Brexit-related uncertainties and US-China trade tensions. That projected growth rate would reflect the weakest since 2009. The International Monetary Fund on Tuesday cut its global growth outlook for the third time in six months, to the weakest pace since the global financial crisis, pointing to Brexit-related uncertainties and trade tensions between the US and China as fueling its downgrade. The IMF projects global economic growth of 3.3% this year, down from the 3.5% it saw back in January. That forecast matches its expectation from 2009, in the wake of the global financial crisis. “Although a 3.3 percent global expansion is still reasonable, the outlook for many countries is very challenging, with considerable uncertainties in the short term, especially as advanced economy growth rates converge toward their modest long-term potential,” the IMF said in its report. The downgrade underscores the heightened fear among market participants that global growth is slowing at a late stage in the economic cycle. In the US, investors are faced with a decade-old bull market and slowing corporate growth that’s expected to be a focal point of the fast-approaching earnings season. Read more: Companies all across America are warning business is slowing down. Here are 6 you should pay close attention to. Improvements to the global growth picture are expected in the second half of this year, the IMF said, and global growth is expected to return to 3.6% in 2020 — but that resumption hinges on a rebound in some emerging-market economies. 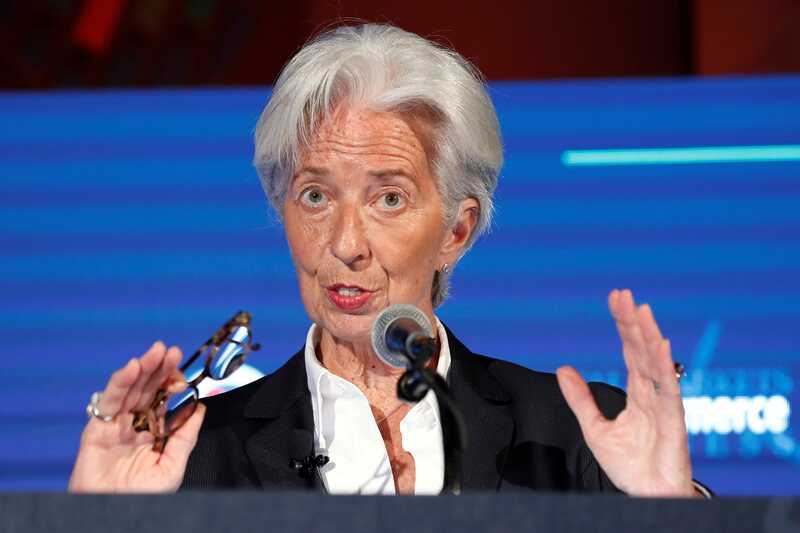 “This return is predicated on a rebound in Argentina and Turkey and some improvement in a set of other stressed emerging market and developing economies, and therefore subject to considerable uncertainty,” the IMF said in its sweeping report. 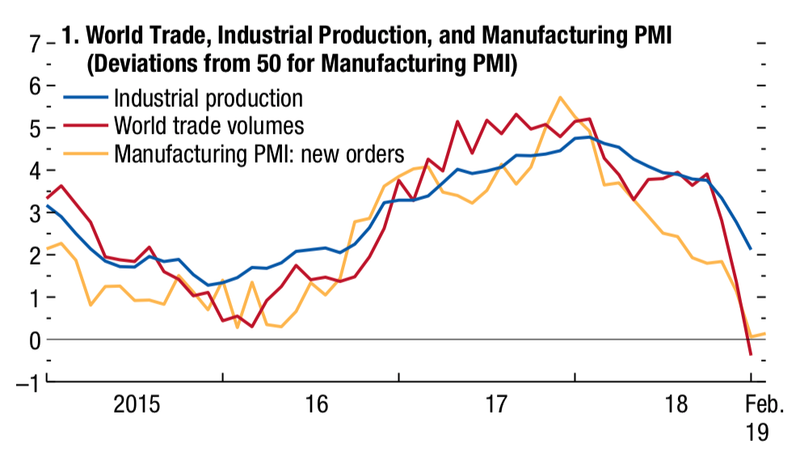 Several measures of global activity like industrial production have softened in recent months, the IMF said, and included this chart highlighting the downturn since the second half of 2018. More broadly, elevated policy uncertainty played a major role in the IMF’s lowered expectations for global growth. A stark example of tensions between the Trump administration and international trade partners was on full display on Tuesday as the European Union prepared to fire back against the US’s latest tariff proposals. In the US, growth is set to decline to 2.3% this year and 1.9% in 2020, “with the unwinding of fiscal stimulus,” the IMF said, citing the impact from the partial federal government shutdown earlier this year. “The downward revision to 2019 growth reflects the impact of the government shutdown and somewhat lower fiscal spending than previously anticipated, while the modest upward revision for 2020 reflects a more accommodative stance of monetary policy than in the October forecast,” the IMF added. In October, the IMF lowered its 2018 and 2019 economic growth projections, pointing to a sweeping adverse impact from the US-China trade war.